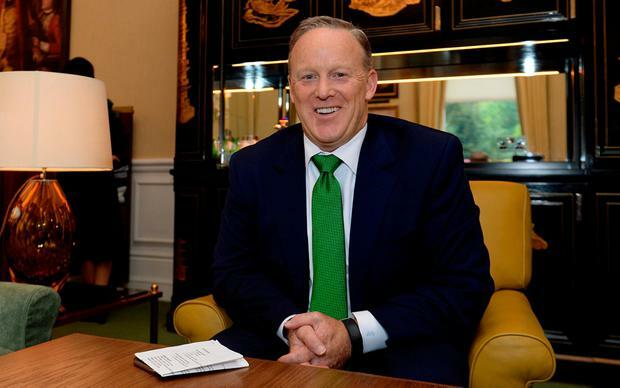 Former White House press secretary Sean Spicer says he’d “gladly consider” taking up the role of US Ambassador to Ireland, should President Donald Trump offer it to him. “I’ve enjoyed serving my country in so many ways and if the president ever asked me to serve it in another way, I’d gladly consider it,” he told the Irish Independent when asked whether the job is in the offing for him. Two prospective candidates were forced to pull out of the process, and the role has been vacant since December 2016 but is fully administered by chargé d’affaires Reece Smyth. But Mr Spicer remained tight-lipped about the likelihood of this happening; he had made it “very clear, over and over” that the conversations between Mr Trump and him stay confidential. He is in Dublin on a book tour where he also spoke at an event organised by the International Institute for European Affairs. ‘The Briefing: Politics, the Press and the President’ is his account of working for the Trump administration, describing the president as “a unicorn, riding a unicorn over a rainbow”. Although he’s no longer officially on the frontline defending Mr Trump’s policies, it’s precisely what he ends up doing, in addition to explaining his own reasoning around some of Mr Trump’s less edifying behaviour. One standout matter is Mr Trump’s apparent penchant for strongmen over his own allies. The more authoritarian the better, it seems. For example, every time the president discusses the EU or Germany – two of America’s most important partners – he lashes out. Since taking office he has commented that “Germany is totally controlled by Russia”; during last year’s German election, he said “the people of Germany are turning against their leadership”. And has complained there are too many German cars on American streets. Mr Trump has also said Brexit is a “great thing” and praised dictators like North Korea’s Kim Jong-un – responsible for crimes against humanity and condemned hundreds of thousands of his own people to forced labour. He gushes at the leadership of Russian President Vladimir Putin who interfered with the US election and has his own reprehensible record on human rights. “The only thing I can suggest is that he is constantly in search of that deal,” said Mr Spicer, who added he believes his allies are most likely taking advantage of him. “He looks at the people he doesn’t have a deal with such as Putin, Kim Jong-un and he says ‘I need to have a relationship with them’. And then he looks at people who we do have a relationship with and in a lot cases feels as though those people have taken advantage. But when it comes to Mr Trump’s support for zero tolerance towards migrants at the US border which led to 2,000 infants and children taken from their parents, Mr Trump’s most reliable henchman doesn’t defend it. “I don’t think there’s any one that sits back and says that was executed well,” he added.